There are some unbelievably creative visualizations of the alphabet here. I'm reminded a little of this business about context mattering more than letter order for reading; some of these alphabets show how the same is true for character recognition. I'm happy to see Obikà, the mozzarella bar, is opening in New York; I just wish they'd open one here in Chicago. My wife and I visited the one in Rome in 2005 just by chance; it was a rainy evening and we both love fresh mozzarella, so we gave it a try, and it ended up being one of the highlights of our week there. We were astounded by the variation between the different mozzarellas we tried there, in texture, flavor, creaminess. Also the service was very good, and I think we got special attention because the place was nearly empty (I'm not sure if this was because it had recently opened, it was a rainy night, or we were just there a little early for dinner). By the way, the article mentions scamorza, a smoked cheese similar to mozzarella that will only make the New York menu occasionally. We didn't try this when we were at Obikà, but I've had it elsewhere in Italy, and I believe my sister even cooks with it. Because it holds together better when heated than some other cheeses and has a strong smoky flavor, it makes a nice meat alternative. 1. Navy Pier might be getting a bigger ferris wheel. I link to this piece mainly because I had a discussion with my sister about the history of the Navy Pier ferris wheel when she was here and we were walking around the midway over on the U of C campus. 2. This piece about Jill Greenberg's portrait shoot with John McCain is worth a look. It stirred up some pretty nasty responses in some of the photography forums I look at. When I first saw the cover shot (at the grocery store?) I wondered how his handlers had allowed that particular lighting -- his skin looks awfully plasticky. I guess it's not quite as grotesque as the wide-angle hdr-looking shot of Daly on the cover of Chicago Magazine this month. This Gary Hart diavlog (with Robert Wright, who apparently wants to have a different conversation and seems even more confused and rambling than usual) is sort of interesting if you know that Hart briefly considered running for president in 2004 that would probably have struck a lot of the same notes as Obama's has. Hart doesn't have half the stature of Obama, but I still wish he'd put his hat in in 2004, because he foreign policy expertise would have given the whole Democratic slate more heft. I also think Hart's insight that Obama needs to make the campaign bigger is essentially right -- that's where Obama lived for the first phase of the campaign, and that's gotten away from him a bit, probably because he felt the need to lay out the details. The news hasn't exactly been good this weekend if you're a nervous Obama supporter, and I appear to have been off the mark in my assessment of Palin's speech last week (if the polls are to be believed, anyway). But to me this press conference with David Plouffe is encouraging. The Obama campaign's internal numbers and analysis have always been better than what's out there, and they always seem to take the long view, which is the most important one. 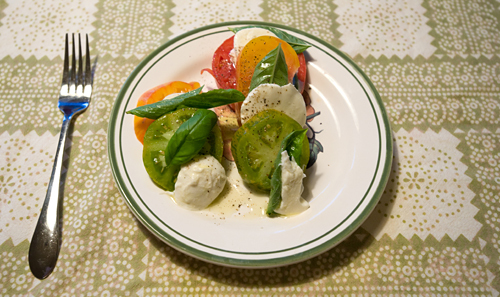 Barrett and his family visited us this past weekend, and he was good enough to assemble the above caprese salad for us (it was delicious). The orange and green tomatoes you see above are from the Oak Park farmers market, while the red one is one of the last from our garden this year. Because we were away so much this summer, the tomato harvest was considerably smaller than it had been the previous couple years. Also, I think because we chose our tomato varieties poorly, they weren't nearly as tasty either. The heirlooms above, by contrast, were some of the best I remember ever eating. My goal at the farmers market next week will be to try a few more heirlooms, get their names, and possibly even keep some of their seeds for next year's garden. If anybody has any advice on how best to accomplish this last item, please share! Your grandfather used to save seeds. He just put them on a napkin to dry out and, once dry, put them in an envelope and then planted them in house in the spring time (he used to use milk cartons as planters). I think it is that simple. I only remember this with tomato seeds. (If you do that with heirlooms and they come up, give me a couple). Some fact checking from the AP is here. I had several other things I wanted to blog about today, but this week has gotten a lot busier and now I'm just going to post some quick thoughts on the Palin speech. Obviously I'm not the target audience, but I had to say that I wasn't that impressed. I think she did it competently, but I'm not sure I even felt like it was well delivered, even if I've already heard a lot of folks saying it was. Really though the biggest problem with it, for me anyway, was the fact that I don't really feel like I know her any better than I did before. She talked about her family, and she talked about her record in Alaska, but I didn't get the sense that she regained control of her story. Instead, I think there will be lots more digging and some tough, tough questions if she ever shows her face at a press conference. Getting control of public perceptions about her was the biggest challenge tonight, and I don't think she met it. Also, while again I wasn't the one she was trying to convince, the attacks on Obama seemed a little harsher than I had expected -- particularly considering the fact that very little has come from the Obama camp attacking her up to now. I suppose they're trying to get him to return fire; hopefully he'll be cautious if he does. So far I think the Obama campaign has handled this situation perfectly, and they should stick to the high ground. All in all though I came away from the speech a lot less worried about the fate of this election than I have been over the past couple of days. She may have riled up the base, but I don't think that was a speech that will bring a lot of independents on board. What it made me want to do is go out and become a community organizer. MORE: As astute as ever, Ezra writes about the missed opportunity for Palin to really tell her story. Via Eric Kleefeld I see that is finally allowing trading on the question of whether Sarah Palin's name will be withdrawn for the veep nomination. I was on the site last night looking to see whether her nomination contract had fallen at all, but apparently that contract expired at the beginning of the convention, which seems a little short-sighted -- especially given the expectation that there might be fireworks at the Democratic convention. I was really disappointed to see that Orange, the great little brunch place in the South Loop, is going to be closing. I've been there a number of times, most notably after running in races downtown, and I'll miss the cucumber slices they put in their ice water. But: they will live on through the internet! A photo I took of their eggs benedict graces the relevant Wikipedia page. I guess if you have to close, having had the paradigm for eggs benedict on your menu isn't a bad record to take with you. Corks and Curds has a quick list of simple suggestions for what wines to serve with what cheeses. I'll definitely be giving a "very dry white" a try with parmesan. The list doesn't get into specifics, so classic pairings like gorgonzola with sauternes (try this if you haven't already!) don't appear. Karen Tumulty gathers the evidence on whether Palin was vetted. If you're wondering what a normal vetting process looks like, Mark Halperin's list of questions may shed a little light on what's expected the process. To vet was originally a horse-racing term, referring to the requirement that a horse be checked for health and soundness by a veterinarian before being allowed to race. Thus, it has taken the general meaning "to check." UPDATE: More from Marc Ambinder. Per the previous post, I've added some more pictures to my flickr set for Terrebonne Parish. Thankfully the hurricane seems to have been weaker than advertised. The 11:00 PM EDT advisory is out. Gustav’s intensity appears to have plateaued, and it's expected to make landfall right around its current intensity -- a borderline Category 2/3 hurricane -- in the late morning or around noon, in the marshlands south of Houma. That city of 30,000, where The Weather Channel's Jim Cantore is stationed, will take the brunt of the storm. Significant deviation from this track now appears unlikely (though small, last-minute "wobbles" are always possible). 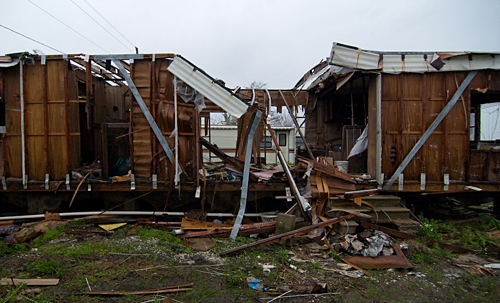 Earlier this year I spent a week in Houma and the bayou just south of the small city; I was there to photograph the work of a local nonprofit called Bayou Grace and the continuing recovery work two and a half years after Katrina. Houma has actually been booming since 2005 because a lot of traffic and shipbuilding related to the offshore oil industry goes through there; before 2005 that traffic went through Venice, but Katrina essentially destroyed that town. I'm glad to hear that the hurricane is weaker than advertised and won't hit New Orleans directly, but naturally I'm really worried about all the wonderful people I met while visiting and photographing that area. Here are some pictures I posted earlier this year from that trip; I'll probably add some more a bit later today. If you want to donate to an organization that will do real reconstruction work in the area, I can personally vouch for Bayou Grace. If you're interested in my photographs, you can also contribute by buying prints of them at this site. This is the archive page for September 2008. The main index is here; other archives can be found below.